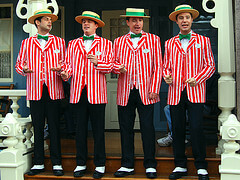 Did you know that the barbershop quartet originated in an actual barber shop? The barbershop style of music is first associated with black southern quartets. Each barbershop actually had its own quartet. The first written use of the word barber shop, as in referring to the harmonizing, came about in 1910 along with the publication of the song “Play That Barbershop Chord”. Barbershop harmony can trace its beginnings all the way back to the birth of traditional Western music. These chants were originally sung in unison, but over the years they slowly began adding harmony. There was no sheet music at this time, so the singers sung solely based on listening. During this era, the local barber was more than just a hair dresser. Barber’s also pulled teeth, and performed minor surgeries. Barbershops slowly became a place for the town to gather and play instruments and sing while waiting for their turn. At the turn of the century, amateur male singers would gather in quartets to perform at parties and picnics. Often time’s barbershop quartets would perform at Minstrel shows as a way to pass time, since no equipment was necessary. In 1938 the Barbershop Harmony Society was formed for male singers. Today, the organization has over 30,000 members and can be enjoyed by many as a fun hobby.